Athletes who participate in high demand sports like soccer, football, and basketball are more likely to injure their anterior cruciate ligaments(ACL). If you have injured your ACL, you may require surgery to regain full function of your knee. This will depend on several factors, such as the severity of your injury and your activity level. Three bones meet to form your knee joint: your femur, tibia, and patella. 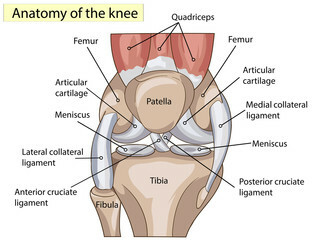 Your patella sits in front of the joint to provide some protection. Several studies have shown that female athletes have a higher incidence of ACL injury than male athletes in certain sports. It has been proposed that this is due to differences in physical conditioning, muscular strength, and neuromuscular control. Other suggested causes include differences in pelvis and lower extremity alignment, increased looseness in ligaments, and the effects of estrogen on ligament properties. Pain with swelling. Within 24 hours, your knee will swell. If ignored, the swelling and pain may resolve on its own. However, if you attempt to return to sports, your knee will probably be unstable and you risk causing further damage to the meniscus of your knee. During your first visit, your doctor will talk to you about your symptoms and medical history. Then during the physical examination, your doctor will check all the structures of your injured knee, and compare them to your non-injured knee. Most ligament injuries can be diagnosed with a thorough physical examination of the knee. A torn ACL will not heal without surgery. But nonsurgical treatment may be effective for patients who are elderly or have a very low activity level. If the overall stability of the knee is intact, your doctor may recommend simple, nonsurgical options such as: bracing to protect the knee from instability and physical therapy to decrease swelling and strengthen the muscles around the injured area. Most ACL tears cannot be stitched back together. To surgically repair the ACL and restore knee stability, the ligament must be reconstructed. Your doctor will replace your torn ligament with a tissue graft. This graft acts as a base for a new ligament to grow on. Grafts can be obtained from several sources. Often they are taken from the patellar tendon, quadriceps tendon and hamstring tendons. There is also another option, to use a cadaver graft. If you have surgery, physical therapy first focuses on returning motion to the joint and surrounding muscles. This is followed by a strengthening program designed to protect the new ligament. This strengthening gradually increases the stress across the ligament. The final phase of rehabilitation is sports specific training.